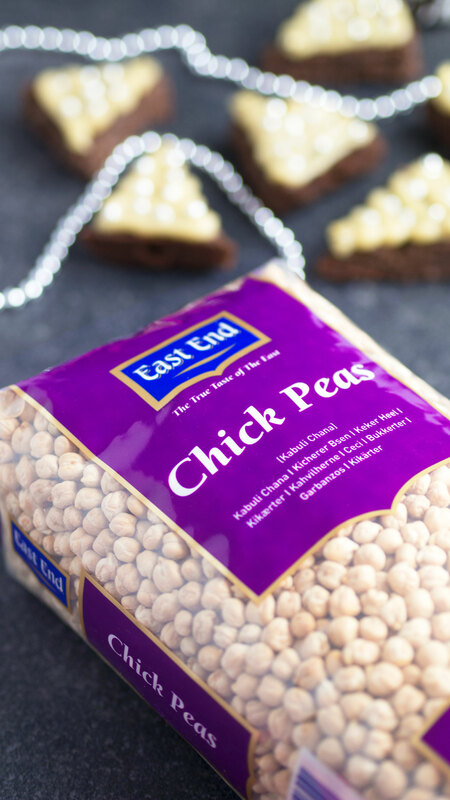 Chickpeas make up a big part of my diet, I eat them on a daily basis in the form of falafel, stews, savoury bakes, calzone, pizza and HUMMUS (of course! 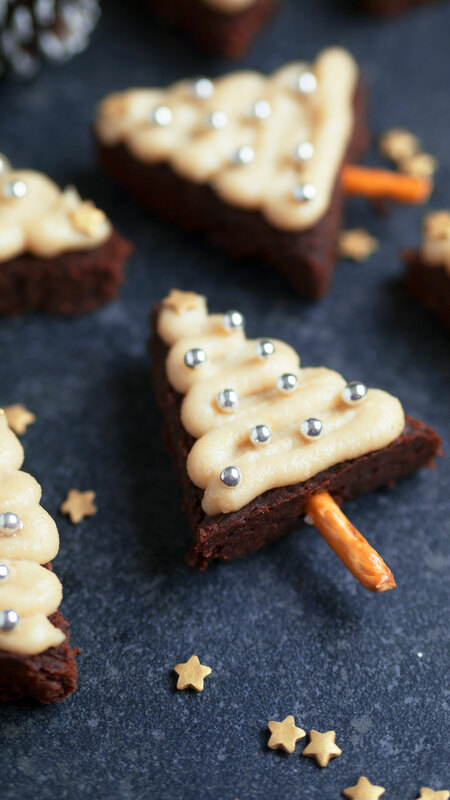 ), but I also love incorporating them into sweet treats to make them as healthy and beneficial as possible. Recent research suggests that the consumption of chickpeas (as well as other pulses and legumes) reduces the risk of some chronic diseases such as diabetes and heart disease*. Their high fibre content also helps improve the control of blood sugar and insulin secretion, all the more reason to add them to your desserts! Instead of using sugar or liquid sweetener, I’ve opted to use whole dates aka the best natural sweetener EVER! It’s true that dates are naturally high in sugar, but they’re also extremely high in fibre and anything high in fibre, especially in its natural form, means it won’t have the same impact on blood sugar and insulin. I’m trying to use whole dates in my recipes as much as possible because I think they’re such an amazing fruit and they add a caramel taste and gooey texture which is perfect for these brownies! I prefer using dry chickpeas as they’re free from the unnecessary salt and added preservatives and they’re much cheaper than canned beans, not that canned chickpeas are luxury expensive items that most of us can’t afford, but every little helps, right? Also, dried beans are so much more convenient. A 1 kg bag of chickpeas will last you ages! You really don’t need expensive, trendy ingredients to eat well! 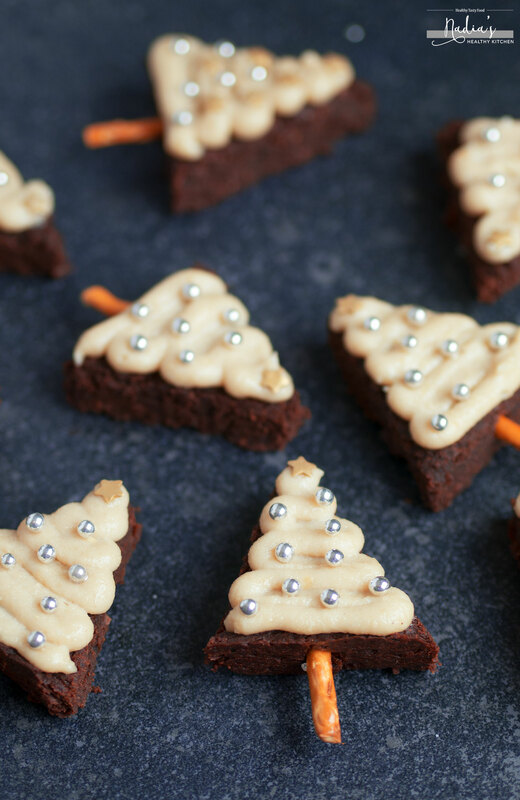 I created a simple cashew maple frosting to decorate the ‘trees’ to resemble the trees being covered in snow. If you prefer green trees, you could always add some matcha green tea powder to the mixture, like I did with my Christmas tree cupcakes last year. 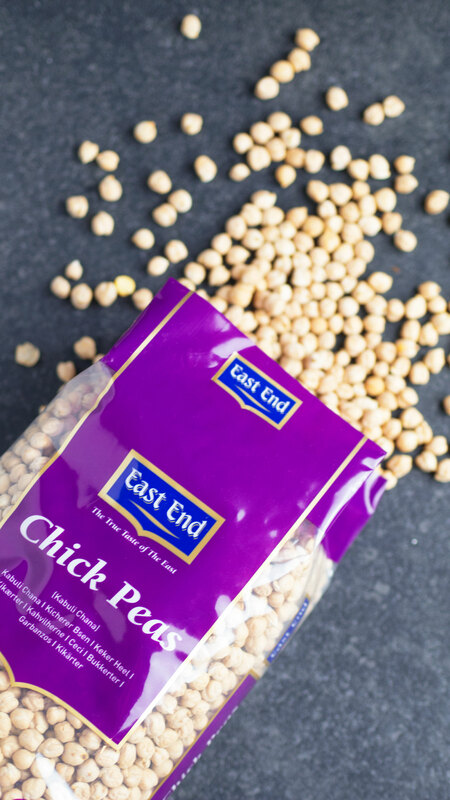 1 1/2 cups (215g) East End Foods chickpeas (measured/weighed after cooking) alternatively you can use 1 can of their pre-cooked chickpeas. Cook the chickpeas according to pack instructions - add 1 cup (170g) of the dry chickpeas to a large bowl, cover with water and soak overnight, and then rinse and cook in a pan of simmering water for 1.5 hours. Leave to cool completely before measuring out 1 1/2 cups (215g) of the cooked chickpeas. Add everything, apart from the chocolate chips, to your food processor and blend until you have a smooth cake batter. Fold in the chocolate chips then transfer the mixture into a 9" square cake tin. Bake for around 30 minutes. Leave to cool completely before attempting to slice. Once cooled completely, slice across into 3 equal pieces, then cut each into 4 triangles so you end up with 12 triangles in total. 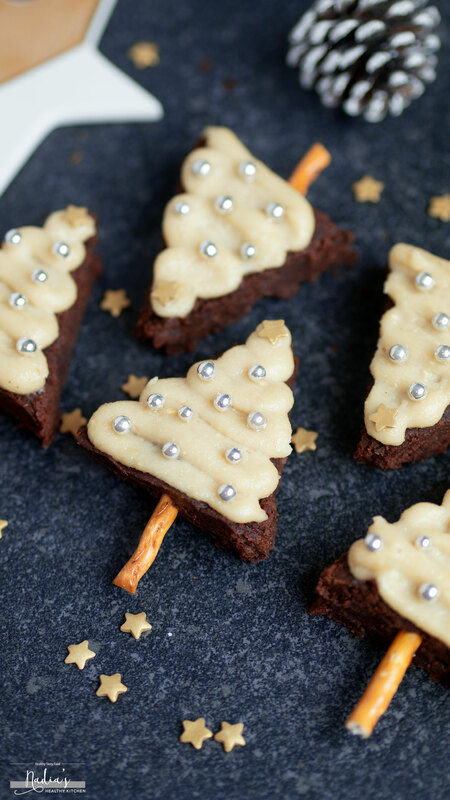 Pipe the frosting over each brownie then decorate. 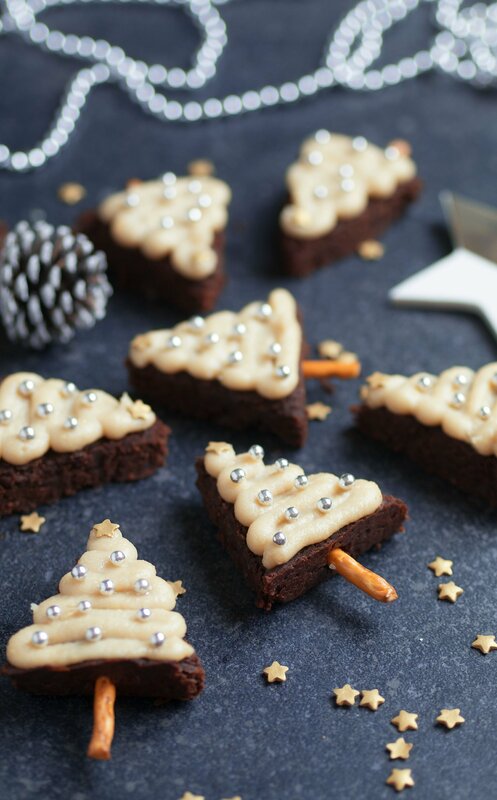 Awww, love how adorable and delish these Christmas tree brownies look, Nadia. Love the use of chickpeas here. 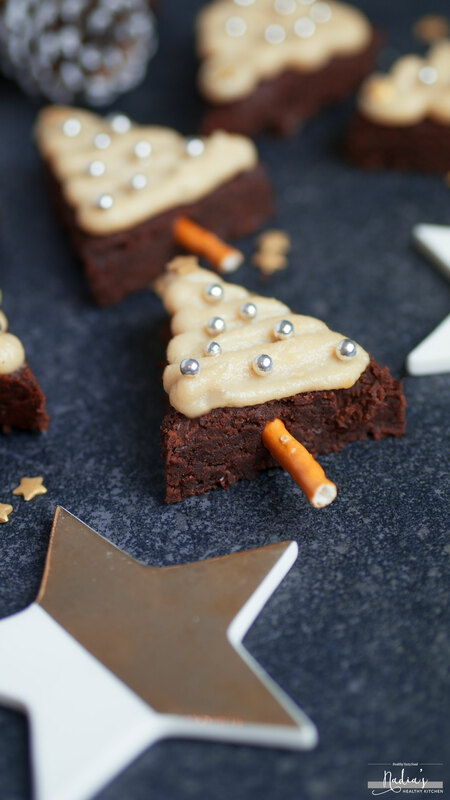 Oooh chick peas in a brownie, I am intrigued! Did you use any of the chick pea liquid, and how moist were the actual chick peas when you added to the processor? I used dried chickpeas that I soaked overnight and cooked until soft (1-1.5 hours) and drained. So I didn’t use any extra liquid apart from what’s stated in the recipe 🙂 If using canned, drain and rinse before using. Do you think this would work in a standard blender? Yes! I used my cheap basic food processor for this. 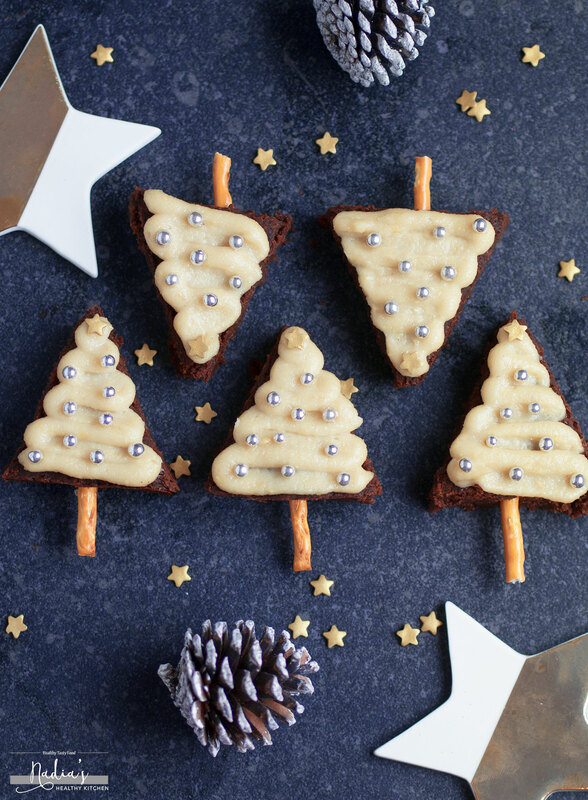 I’ve done this Christmas tree browies and everyone loved them! It was a huge success! Thank you Nadia for sharing with us your recipes!